What ‘truths’ are women told about who they are and how they should behave? What tales do they tell themselves? 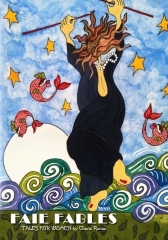 Faie Fables is a series of one-page fables, beautifully illustrated by female-empowering artist, Cher Odum. It challenges women to re-envision their lives and their dreams. These lyrical, engaging stories are accompanied by Postnotes (with questions) to further engage the reader, and the colorful images are a feast for the eyes. Love this book! It is beautifully illustrated with colorful, playful paintings, and the stories are very inspiring and empowering to women. I really like how the author and illustrator both give their individual perspective and comments on each story/painting. – A. M.
I love this book! It is beautifully illustrated, speaks to the empowerment of women, and would make a great gift this holiday season. – Alicia Murray.